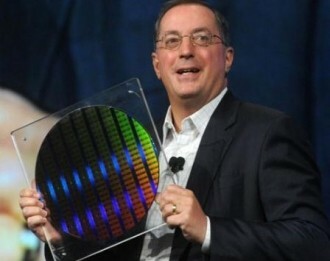 Intel is reportedly preparing to launch the upcoming 22nm Ivy Bridge series of processors on or around April 8. The company is expected to release a total of 25 Ivy Bridge chips during this time frame, according to PC makers in Taiwan as reported by DigiTimes. 17 of the CPUs set for launch are desktop models while the remaining eight will be designated for notebook and ultrabook use. Desktop parts include quad-core Core i7-3770K, 3770, 3770S, 3770T, and Core i5-3570, 3550 and 3450 models with prices ranging from $184 to $332. The Core i5-3470T should be available in May for $184. Desktop chipsets on the agenda include Z77 ($48), H77 ($43), Z75 ($40) and B75 ($37), with Q77 ($44) and Q75 ($40) coming on May 13, the sources said. Notebook processors Core i7-3920Qm, 3820QM and 3720QM will be ready in April for $1,096, $568 and $378, respectively. Other models including Core i5-3520M, 3360M, 3320M and ultrabook-specific Core i7-3667U and Core i5-3427U will be unveiled at a later date. Accompanying notebook chipsets HM77 ($48), UM77 ($48), HM76 ($43) and HM75 ($40) are coming in April. QS77 ($53) and QM77 ($48) are expected in May. Intel’s Ivy Bridge processors were originally rumored for a March 2012 release, according to a tip from motherboard manufacturers but it seems that Intel (or board makers) weren’t able to meet that deadline. The chips are expected to offer a 20 percent overall performance boost over comparable Sandy Bridge CPUs on the processing side. A reworked internal GPU will produce 30 to 60 percent better overall graphics performance with DirectX 11 and OpenCL 1.1 support.